Sign up for any of the following optional activities by updating your SuperConference Registration. Grab a quick bite to eat when General Session ends on Saturday afternoon and meet up with us on property at 1:00 for fishing and golf! Combine these two great outdoor activities for a unique and memorable event that is both fun and competitive. Bass & Birdies is the combination of a 9-hole golf tournament AND a fishing tournament. Each team competes at golf and fishing all in one fun-filled afternoon. Team golf scores will be combined with total weight, total fish, and/or largest fish caught. Not bringing your clubs? Don’t worry, you can rent clubs for an additional fee of $50; it includes 1 sleeve of golf balls. For meeting & conference guests of the resort, Disney offers exclusive Partial Day tickets (After 2:00 PM Ticket and a 5:00 PM Twilight Ticket), as well as a 10% savings on multi-day (2+ day) tickets. All multi-day tickets include an additional complementary “Bonus Visit” admission to a Disney Water Park, Mini Golf or 9 holes of golf at Disney’s Oak Trail course. 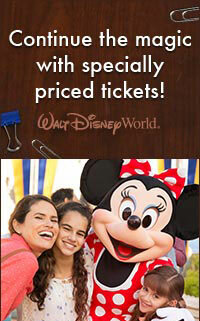 These tickets are ideal for guests arriving early or staying after the meeting and wish to visit the Disney theme parks. As a Good Neighbor Hotel, the Omni offers exclusive, discounted Walt Disney World tickets while you are visiting Orlando. Order in advance to take advantage of exclusive afternoon tickets and savings on our multi-day tickets! Advance purchase your full-multi-day tickets of 2-Days or longer and save 10%, plus receive a complimentary bonus visit to an additional Disney Experience on select tickets!